When does 4 equal 2? 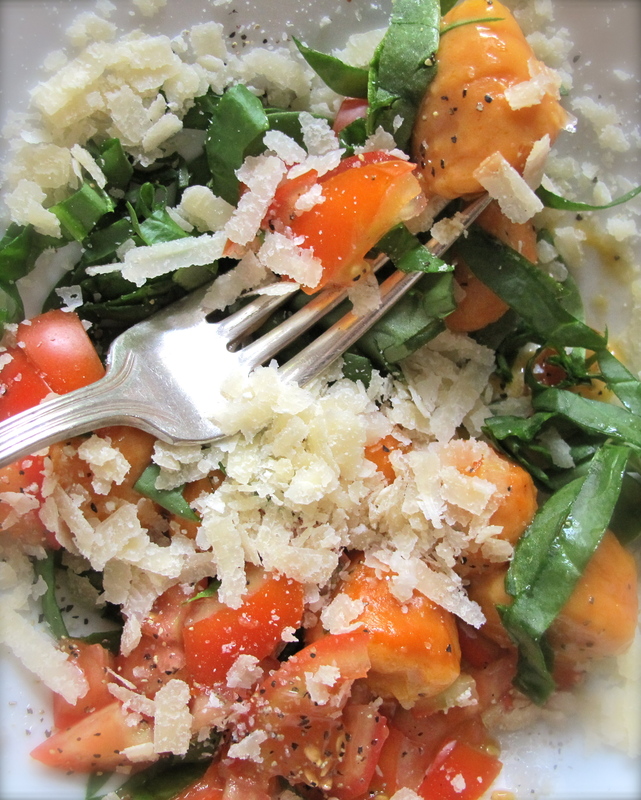 When 4 first-crop small ripe tomatoes from my garden became 2 simple, fresh meals in just minutes. Each meal uses 2 small ripe tomatoes. Weekend meals should be easy to prepare, should incorporate fresh from-your-garden, or the farmer’s market, vegetables & fruits, should definitely be enjoyed with a crisp chilled glass of wine and each bite should make you very, very happy. 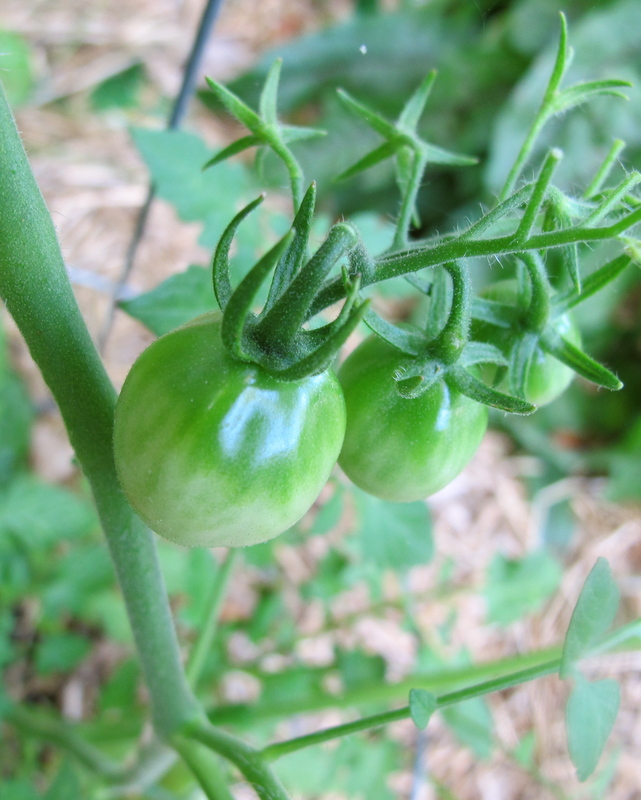 The thrill is never gone when I find ripe tomatoes in my garden after weeks of waiting, watering and wondering. Saturday morning I found these little jewels hanging ripe on the vine waiting for their close-up. 1. Arrange tomato slices in a ring around the outside edge of a dinner plate. 2. Add a handful of arugula in the center of the plate. 3. Create “spokes” with the bell pepper strips. 4. 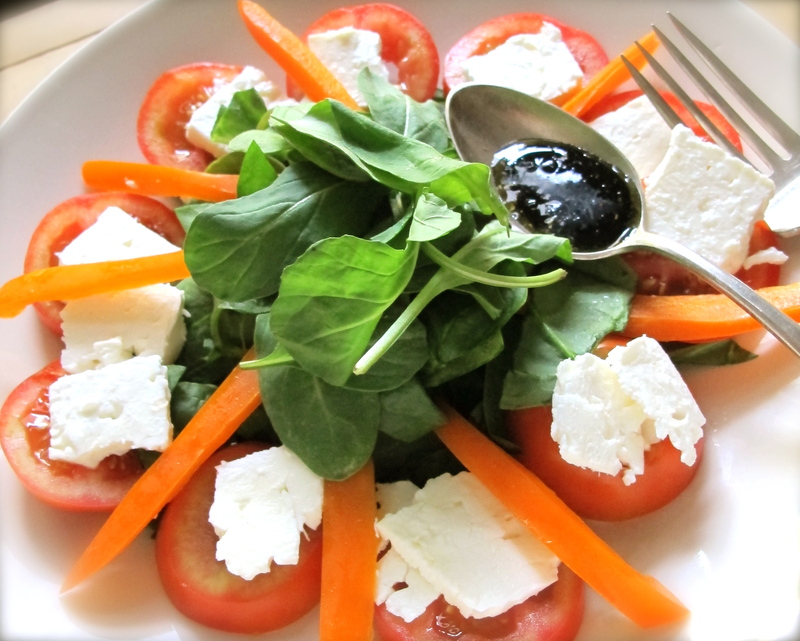 Evenly arrange feta slices over tomatoes. 5. Serve with a drizzle of your favorite home-made vinaigrette. Season with sea salt & cracked black pepper. 1. Cook fresh Gnocchi/pasta in boiling salted water for about 2-4 minutes. Drain quickly & return pasta to pan. A few tablespoons of cooking water should be left in the pan. 2. 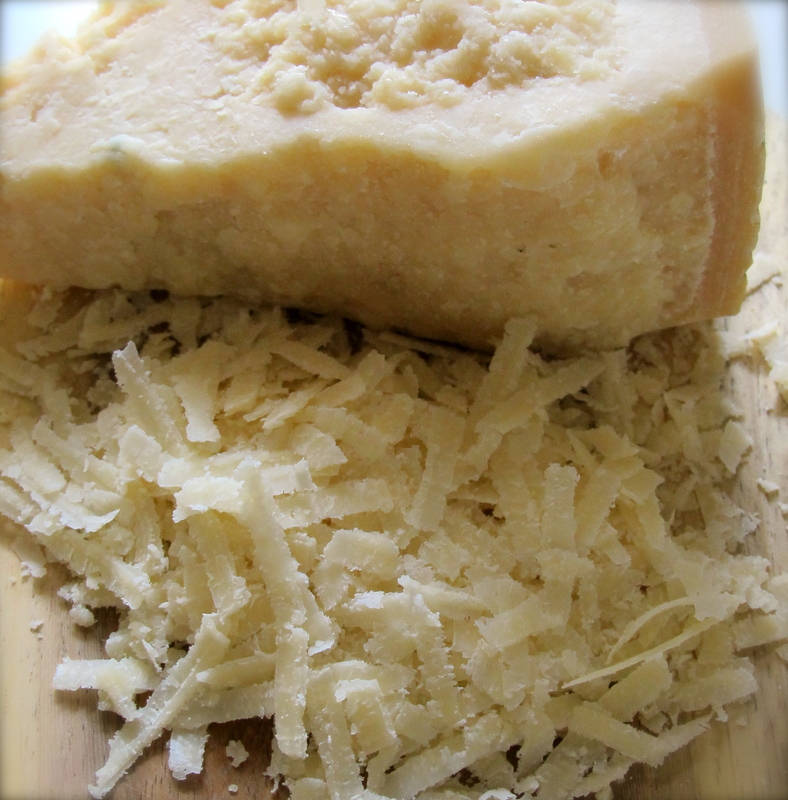 Add a generous 1/2 cup grated Parmesan & toss with pasta & pasta water. 3. Add portions of Gnocchi to serving bowls, sprinkle shredded spinach leaves over the top. 4. Scatter chopped tomatoes & additional grated Parmesan. Season with sea salt & black pepper. i am not a big tomato fan… but this looks really good. James, we must convert you….you are Southern aren’t you? I am going to conjure up a recipe that a non-tomato-fan might love and bring it over for you to try. Thanks for the comment. Teresa, you could make dirt look good enough to eat…nice! Well Betty what a nice thing to say. I so appreciate you taking the time to check in. Now I must go make some more “dirt” recipes. Hurray! the first ripe tomatoes from the garden are reason to celebrate—the wait is finally over, the start of many such meals that speak of summer. I have one tomato in my garden that is getting close to that celebratory moment. I am saving a tomato for you for this Sunday when we work the puzzle. We’ll have on toast with cheese. Yum. So true, so true. thanks. Wouter, i am sorry you missed these little jewels. They were so tasty and had just the right acidity. Small, but wonderful. Brava, I can’t believe you already have tomatoes, you are the Mater Master! (get it? “mater” as in Mother and “Mater” as is well…tomato). Mine are still weeks away but when they come in we will have tomatoes’ coming out of our watusi! I was a little overzealous with my planting this year but I see some canning in my future…salsa’s, marinara…..can’t wait! Whit, I planted this tomato plant early on and it already had flowers on it! That is why I have a few early tomatoes. I look forward to your bumper crop and hope to share in the bounty. Let’s can one day! 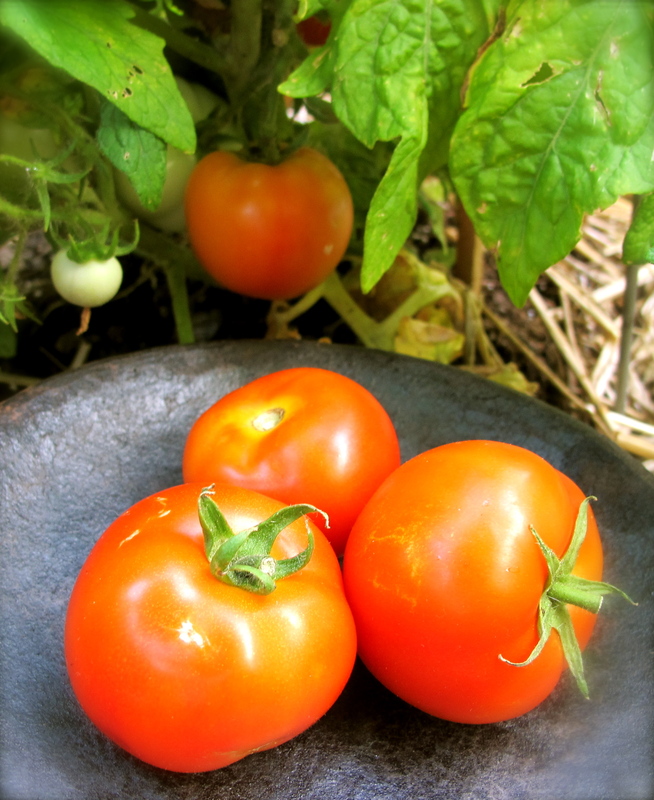 I know that summer is really here now, now that homegrown tomatoes are ripe enough to pick from our own gardens. 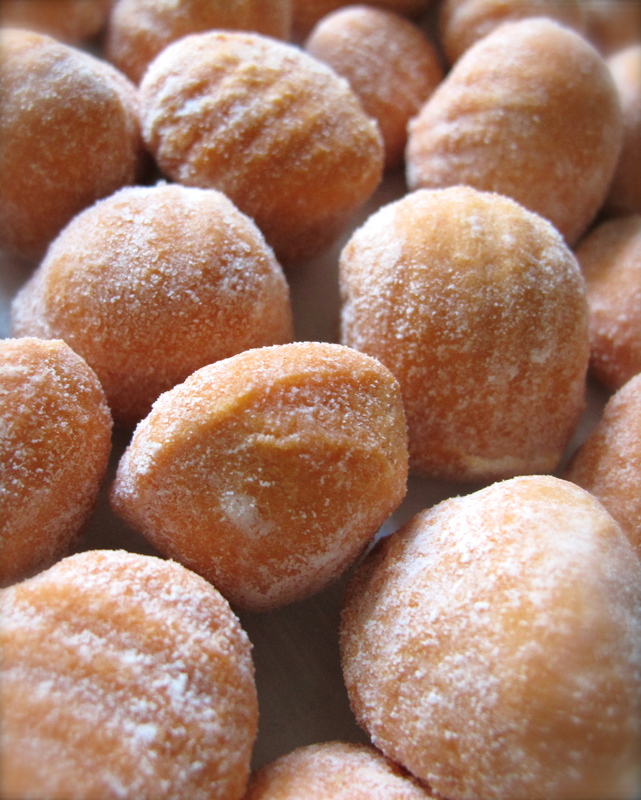 We have also been able to buy Bradly’s at the Farmers Market. I enjoyed my first BLT of the season for lunch today….